Whether you’re exercising as an athlete, suffer from muscle pain or you simply want to look your best, it’s always handy to find faster ways to achieve your goals, right? So should the range of Compex muscle stimulators be on your shopping list? With this review we want to help you make an informed decision. 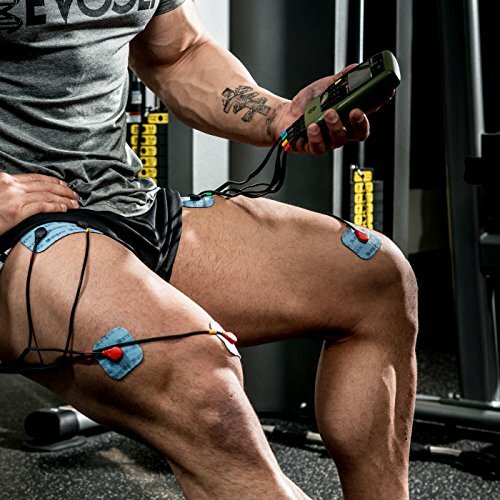 To start with the Compex company is a market leader in muscle stimulators. That’s because their product range is backed by 30 years of experience. This doesn’t only relate to muscle stimulation but also physiotherapy, pain treatment and sports training. You may also want to look into our inversion table reviews. Based on this the company produces various products to help with different scenarios. Should their muscle stimulators that use EMS Electro Muscle Stimulation be something you need to consider? Muscle stimulators provide electrotherapy in the form of EMS. This happens when electrodes send impulses to affect blood flow as well as cause muscles to contract and relax. This is a continuous cycle that stimulates and strengthens. It can also minimize inflammation. 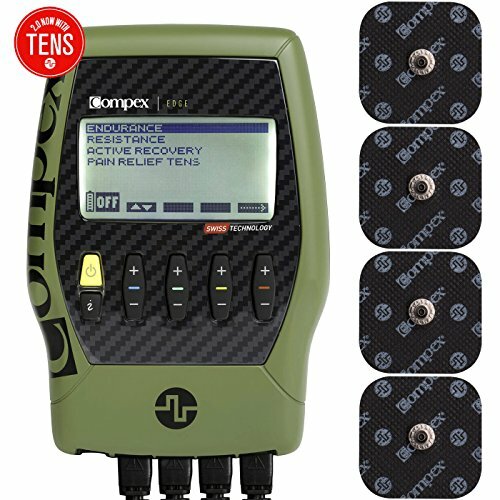 The Compex range not only incorporates EMS but TENS (Transcutaneous Electrical Nerve Stimulation). While EMS is used primarily for muscle strengthening, TENS uses micro current pulses. This can effectively treat pain. This is done by blocking some pain signals from reaching the brain. Applying this to certain areas can give localized pain relief. This makes recovery easier or can give patients who suffer from intense muscle pain temporary reprieve while the body still heals. This feature can now be found in all the Compex models as you’ll see in their reviews below. A popular model in the Compex range is the Compex Sport Elite. It’s sought after because it pushes boundaries. Apart from helping your muscles warmup and increase their endurance—this is what EMS can do—this model can build explosive strength through the more advanced technology it offers. It’s much superior to the Edge 2.0 model since it targets strength training unlike the Edge which only helps with basic recovery and resistance. The Sport Elite is also better than the Performance 2.0 model which can help with building strength, but not explosive strength. The Sport Elite can also provide recovery and relaxation settings which the more basic units do not have. The Sport Elite is similar to the Compex’s wireless 2.0 model, but it still uses electrodes instead of wireless pods. Muscle stimulators have been used effectively for years in sports environments and even in the medical arena. They help to simulate different types of muscle movements. This can be a more comfortable manner to warm up or it can help with recovery if it’s difficult to move your entire body. When added to a regular training regimen it can improve results—toning, strengthening or firming—because it causes muscles to work more. Along with strenuous exercise they help athletes build muscle as they assist with effective warmups and help prevent and heal injuries. Athletes can then exercise harder than usual. What it can’t do is help burn fat. If used in isolation these minor muscle movements sparked by EMS won’t influence fat burning in the body. Are electronic muscle stimulators safe? Some EMS models are FDA approved and used in medical environments. As long as they’re used according to the instructions they’re safe for personal use. If any signs of wear and tear appear it’s best to replace the electrodes or pads. This takes it one step further than many other stimulators because you can build your muscles with strength training, instead of simply maintaining them or helping to heal injuries. The muscle stimulators that run at low frequencies can even be used for relaxation after an exercise session. Users are advised to alternate between 2x4 and 2x2 electrodes to determine which give the best treatment, based upon your unique requirements. This model is also approved by the FDA which gives many consumers peace of mind. 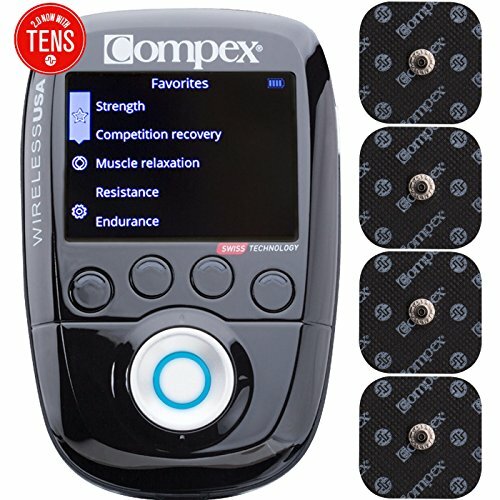 This is very similar to the Compex Wireless 2.0 muscle stimulator. It has many of the same features such as helping with relaxation and competition recovery which not all the Compex units are designed for. The Sport Elite 2.0 is also different than many other wired units because it doesn’t stop at helping athletes with resistance training. It goes one step further with its ability to help improve strength. But not simply strength; explosive strength. This makes it a viable option for serious athletes’ shopping lists. You can have an instant way to enhance your workout results. While you can’t connect wirelessly this is still a great device because the interface is so easy to manage and it’s still quite compact. If you do need assistance to find out more about attaching all the components you’ll find help online. The wires are color coded to make it easier to use as well. The unit comes with a carry bag so it’s easy for athletes to make it part of their regular gear, without the chance of the electrodes getting damaged during transport. A word of caution is to start using this at a low setting at first. The high level stimulation may feel good but you don’t want to injure yourself by starting with too much too soon. In due time you can use the five levels of progression designed to help you improve systematically. When shopping for your muscle stimulator relevancy matters. You need a device designed for what your situation requires. Here you have the same look as the Sport Elite 2.0 but the focus is quite different. You can build your strength but not quite at the level of explosive strength some sports require. 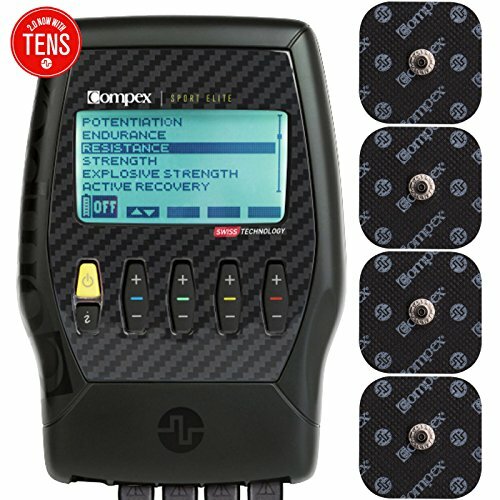 As with all Compex units you can counter the pain after a workout with the TENS pain management feature. This makes it a training but also an after care device. You can customize your experience further with the five levels of progression. All of this is managed via an easy to understand interface on the unit that’s barely bigger than a man’s hand. You can opt to use it at home, but the compact design makes it easy to pop into your training bag. It takes a while to figure out where the best places are to place the pads on your body. Users should take time, adjust their placement and compare the impact of the different positions. The Compex technology works because you can focus on certain muscles at a time instead of over exerting your entire body. With the Edge 2.0 model the focus is on endurance and resistance, but also recovery and TENS. The features are helpful to people suffering from pain. At a more affordable price than high end units—designed for athletes—this is a viable option for anyone wanting to manage pain. 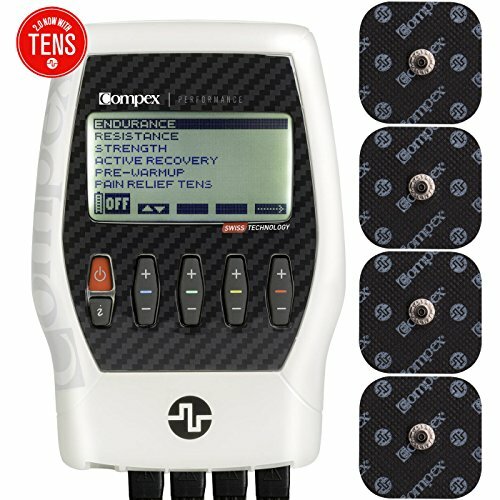 The TENS feature can have an impact in as little as five to 10 minutes. 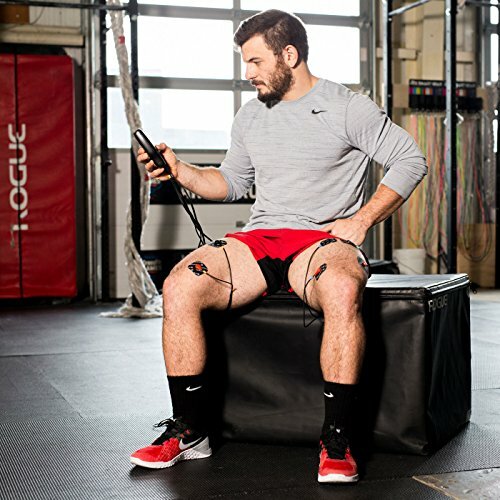 You can see there’s a Compex muscle stimulator for almost anyone. Whether you’re a committed athlete, an occasional jogger or someone who needs an original way to manage pain, this technology can help. And you can find one that matches your requirements but also your budget. Which one will you pick?